Prime Minister, Shri Narendra Modi, has greeted the Nation on Independence Day. “ स्वतंत्रता दिवस की शुभकामनाएं। जय हिंद। Happy Independence Day. Jai Hind! ”, the Prime Minister said. 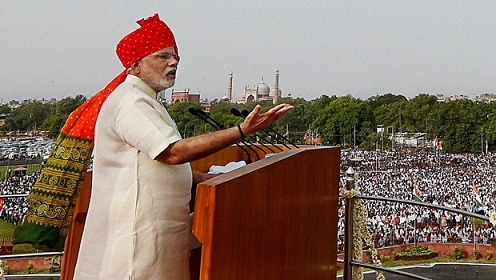 PM also address the Nation from the ramparts of the Red Fort on the 70th Independence Day. Prime Minister Narendra Modi said, its duty of 125 cr people to transform 'swaraj' into 'suraaj'. Addressing the nation after unfuling the National flag from the rampart of Red Fort, the Prime Minister said,Gram Pradhan to Padhanmantri, everyone has to perform his duties to attain 'suraaj'. Prime Minster said, Surajya, the meaning of this is- a qualitative and positive change in the lives of the citizen of India. Prime Minister said, country has many problems, but it also has capabilities.He said government is surrounded by expectations. Prime Minister remembered great leaders like Mahatma Gandhi, Sardar Patel, Pandit Nehru, countless people who sacrificed their lives so that we attained Swarajya.